A smart way to put pure analogue BBD sound on your ’board. Typical analogue BBD sound; flexible tonal control of the repeats. Foot control of crucial parameters. 600ms delay (longer than many vintage units). Voltage doubling with 15-volt power rails for increased headroom. Some players might bemoan the lack of onboard modulation. The heyday of the bucket brigade analogue delay pedal may have been in the late-'70s/early-'80s before digital took hold, but the sound that blends so well with guitar tone still resonates with players today. And the fact that BBD chips are being manufactured again means it’s just as easy to buy an analogue delay today as it was back when the likes of the Boss DM-2, the green MXR Analog delay and Electro-Harmonix Memory Man pedals held sway. 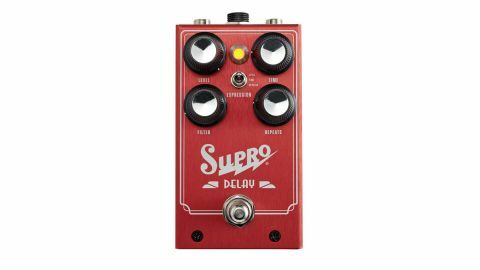 This new Supro 1313 Delay has a solid connection to that era, with circuitry by Deluxe Memory Man designer Howard Davis - and added features that increase versatility means it’s no retro throwback. With analogue sound based around a pair of MN3005 chips, the pedal has the expected knobs for delay time, repeats (feedback) and volume, with an additional Filter knob to tonally shape the repeats. Encompassing both low-pass and band- pass functions, its practicalities are that you can go from fat and murky sounding repeats through a whole range of shading to brighter, thinner and more percussive sounds. Somewhere between the two extremes we were able to match the tone of the repeats to our vintage Boss DM-2 and Ibanez AD-100 BBD delays, plus the tape sound of a Roland RE-201 Space Echo. For anyone who wants to add an extra layer of expression to their playing without getting down on their knees, an expression pedal can be assigned to take on the individual functions of the three other knobs. Setting delay time by foot pedal might be less precise than a tap tempo switch, but it’s smoother and will give you those weird pitch-shifting transition sounds if desired. The old staple of turning up the feedback to the point of self-oscillation now has the possibility of being conjured up and pulled back from the brink while you continue playing, but it’s probably the less-gimmicky control of volume that’s the most musical, swelling in repeats or pulling them back for particular notes or phrases. With all of the multi-effects-style delay pedals out there, you probably wouldn’t be looking at this if the pure analogue BBD sound wasn’t exactly what you wanted. That being the case, its tonal variations and expression options make this a smart way to put that sound on your ’board.